This is a trophy presentation to an individual, association, group, force, or organisation who you feel have particularly contributed to Hastings Week 2015.
and Hastings Week Vice Chair Ion Castro. 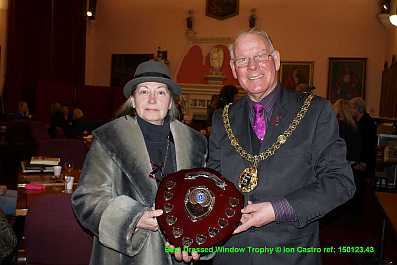 The Bowskill Trophy is presented annually in memory of Cyril Bowskill who, with his wife Joan was a great supporter of Hastings Week, from majority vote based on public nominations it is awarded to the person, group or organisation who has done most to promote the prestige of the week. Hastings Week is actually more than a week of events, including as it does both weekends either side of October 14, the anniversary of the Battle of Hastings in 1066 and has grown from the single Hastings Day celebrated on October 14th. 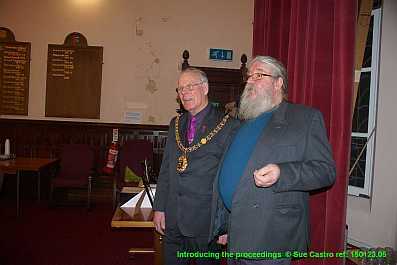 Chairman Nigel Hogben was unwell so vice-chairman Ion Castro deputised. 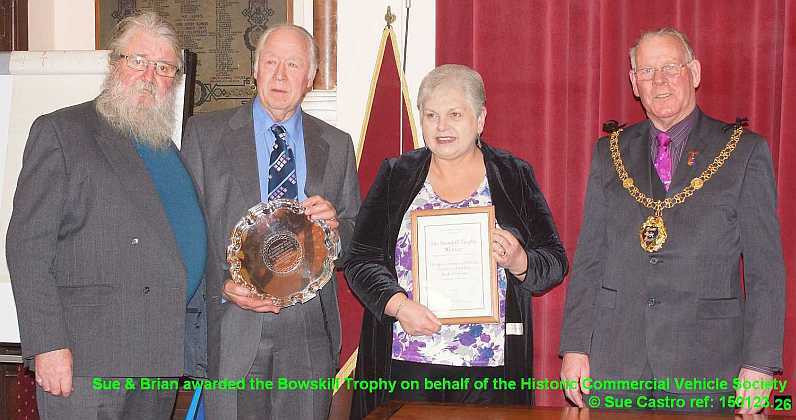 The awards were presented by Hastings Mayor, Cllr Bruce Dowling and the prestigious Bowskill Trophy was received by Sue and Brian on behalf of The Historic Commercial Vehicle Society. The society organises the Sprat and Winkle run from Sevenoaks to the Stade in Hastings on the last Sunday of Hastings week. 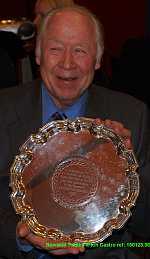 Special mention was made of Andy Garner who had been the principal organiser until his untimely death last year. 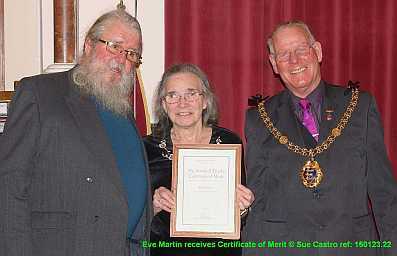 The award recognises the huge effort that the society invests in making the run such an enormous success. Certificates of merit were also awarded to Mandy Ashenden from Tesco’s for her help with the schools painting competition and Eve Martin for her continued support Hastings Week. Traders in High Street and George Street dress their windows during Hastings Week to compete for the Pam Brown and Ray Goode trophies. 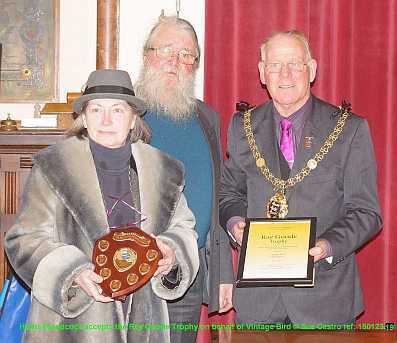 Harris Woodcock, from the Old Town Traders Association collected the trophies on behalf of Little Treasures and Vintage Bird and a certificate of merit that was awarded to Habibi. The final presentation, the schools painting competition organised by Jean Hobson and Eve Martin was won by Emily Wells of Pebsham Academy. The presentation was made by Mandy Ashenden from Tesco’s who had sponsored the event. 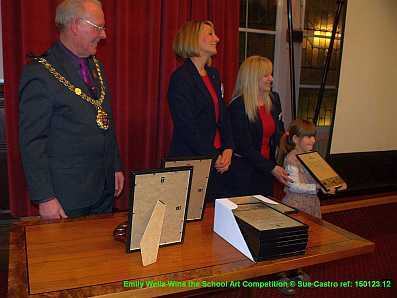 Each year primary schools in the Hastings area compete for the award with their individual interpretations of the Bayeux Tapestry.